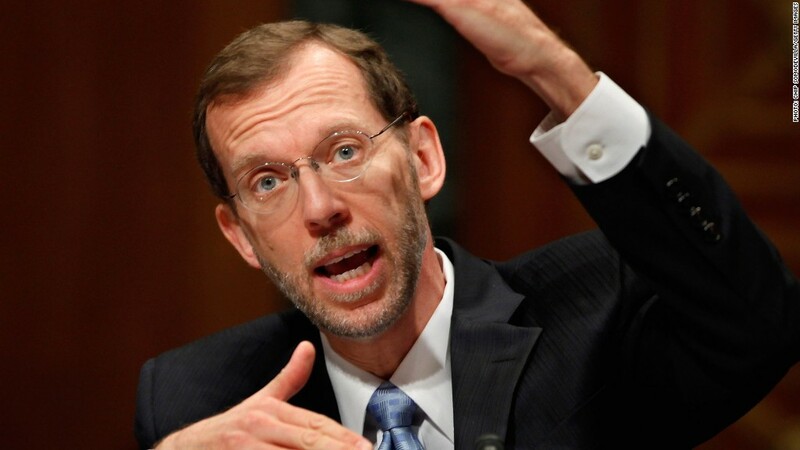 The Congressional Budget Office, headed by Douglas Elmendorf, now projects this year's deficit will be $200 billion less than it projected a few months ago. But it's not all good news over the next decade. Annual deficits are falling even faster than the Congressional Budget Office predicted back in February. And the country's total debt is set to fall as share of the economy for a few years. But the downward trend won't last since lawmakers haven't implemented measures to address the long-term drivers of the country's debt. In its updated budget outlook released Tuesday, the CBO now estimates the annual deficit for this fiscal year will be $642 billion or 4% of GDP. That's $203 billion less than the agency estimated a few months ago. The CBO attributes the improved estimate to higher-than-expected tax revenues and an increase in payments to the Treasury by mortgage giants Fannie Mae and Freddie Mac. By 2015, the deficit will fall to its lowest point of the next decade - 2.1% of GDP. And it will remain below 3% until 2019, at which point it will start to increase again. Deficits below 3% are considered sustainable because it means budget shortfalls are not growing faster than the economy. Similarly, the CBO now estimates the country's total debt - the sum of annual deficits accrued over decades - will fall to roughly 71% of GDP in 2018 and 2019. That's four percentage points below where it is today. But then the debt will begin climbing higher again, reaching 73.6% by 2023. "Budget shortfalls are projected to increase later in the coming decade ... because of the pressures of an aging population, rising health care costs and growing interest payments on the federal debt," the CBO said in its report. Much of the deficit reduction taking place in the next few years is the result of several measures that don't address those pressures. Specifically, the expiration of the payroll tax cut that workers had enjoyed over the past two years; increased tax rates on high-income households; across-the-board budget cuts known as the sequester; and lower spending caps for domestic and defense programs between 2014 and 2021. The improving economy is also a factor, because that leads to more tax revenue. But many economists, including those at the CBO, estimate that the economy would be growing even faster without this year's sequester. And despite the deficit reduction taking place now, the CBO still expects interest on the debt to grow significantly as a share of the economy. The good news is that projected net interest costs over the next decade will be nearly $200 billion lower than the agency estimated in February. But it still projects interest costs will more than double as a percent of GDP between this year and 2023. "When interest rates return to higher (more typical) levels, federal spending on interest payments would increase substantially," the agency said. In the meantime, however, the better-than-expected deficit for this year buys lawmakers more time before they have to raise the debt ceiling, which is the country's legal borrowing limit. The CBO now estimates that Congress will need to act "most likely in October or November." Despite the improved near-term outlook, however, the CBO cautions that rising debt in later years would have "serious negative consequences." Among them, a slower economy. If the government is spending far more than it takes in year after year, it either needs to borrow more or tax people more to make up the difference. That leaves less money for investment in the private sector and productive capital, such as factories. In turn, that can hurt economic output and incomes. Barring any policy changes, the imbalance between spending and revenue will grow to unsustainable levels. The Government Accountability Office now estimates that by 2030, incoming federal revenue won't be able to cover much more than the big entitlement programs, including Medicaid and health insurance subsidies, and interest on the debt. By 2040, it won't even be able to cover all of those.